The apartment of the man accused of killing his infant son and girlfriend last week was filled with Nazi memorabilia, an arsenal of weapons and evidence of a strange religious cult. Michael Parrish shared the home with his girlfriend, Victoria Adams, and their son, Sidney. It was plastered with photos of Hitler, Nazi symbols, books and videos. But it contained something else as well. Hanging in several rooms in the apartment was a peculiar symbol. An inverted peace sign, made with twigs from branches. There was even one in the baby's room. A symbol, called Life Rune, was a character from the Runic alphabet that signified life, creation, birth, rebirth and renewal. It was also used by the Nazis on the graves of SS soldiers signifying the soldier's date of birth, according to the Anti-Defamation League, which fights anti-Semitism and all forms of bigotry in the U.S. and abroad. It is also known as Odin's tree, or Odin. That's how Parrish used to refer to it, according to Luis Gonzales, the boyfriend of Adams' mom, Kim Adams. Racists use the sign to denote "Giver of Life," in relation to women in the white supremacist movement, the ADL said. 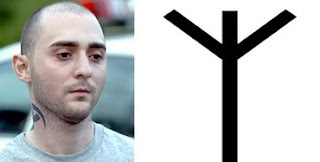 But more significantly, it's the sign of the National Alliance, a neo-Nazi organization led by William Pierce and based near Hillsboro, W.Va. It is the largest and most active neo-Nazi organization in the United States, according to the ADL. The motto on the group's Web site is "Toward a New Consciousness; a New Order; a New People." The home had another bizarre feature — a shrine Gonzales referred to as the prayer room. "Usually, when I went there with Kim, he'd go into the prayer room. He was real antisocial," Gonzales said. The room was dedicated to the Nazi movement. Pictures of Adolph Hitler, Nazi signs, SS uniforms. "He collects artifacts like that. He had maybe 100 DVDs of Hitler. The police took that," he said. The room also had the "sticks" on the wall, the Odin symbol made from branches. The center of the room contained an altar. On the altar was a picture of Sidney next to a plate with some burned material, according to Gonzales. There were also candles around the room. "He'd put a mat down on the floor and pray to the stick," Gonzales said. There was also a coffee table with books in the room. "He wrote passages in them about his belief in the stick," Gonzales said. During one visit, Gonzales and Parrish talked for a couple of hours. That's when Parrish showed him another of his collections. "He showed me the two) AK's he got for his birthday. The 20-gauge shotgun Victoria gave him two years ago, when they first met, a .357, a 9 millimeter, a .38 and a stockpile of ammo about three feet high," he said. Since Barack Obama became president, Gonzales said Parrish started stockpiling ammo, guns and food. "In case of war," Gonzales said. "He was a real fanatic — a real racist," he said.